* Universal (Top, Bottom, End) M6 bolt mounting options for crossbar, combined with rotation of handlebar clamps, gives infinite adjustability. * Mounts directly to 31.8mm handlebars. * Mounts to 25.4mm or 26.0mm handlebars via optional shim set. * Weight = 86 grams including hardware, without shims. * Silver or Black anodized. * Compatible with round handlebars only. Not compatible with aero shape handlebars. * Bar Clamp Width = 10mm. 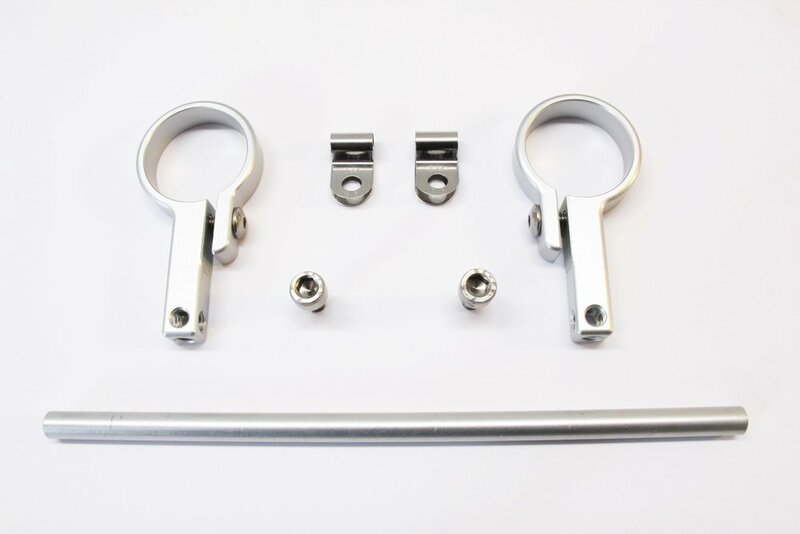 Need more extension for the cross bar to reach the handlebar bag on your particular bike setup? No problem, check out our add-on Anyway Mount 30mm Extension kit to place the decaleur cross bar a total of 70mm off of the handlebar. 1) Install Anyway Mounts on either side of stem clamp. 2) Install two P clamps on the cross bar and thread M6x10 bolts through P clamp holes and into Anyway Mount. 3) Rotate Anyway Mounts and/or change mounting orientation of M6x10 bolts to locate cross bar in the appropriate location for your bag's rail hooks. Each bike's setup will vary with stem length, stem height, and bag size. 4) Use a 3mm hex wrench to tighten Anyway Mount M5x15 button head bolts to 4Nm. 5) Use a 5mm hex wrench to tighten M6x10 socket head P clamp bolts to 4Nm. --- It is recommended to use Loctite or similar thread locking compound on all bolt threads.